I'm reviewing Red Riding Hood in full admittance that this film is really not my cup of tea. 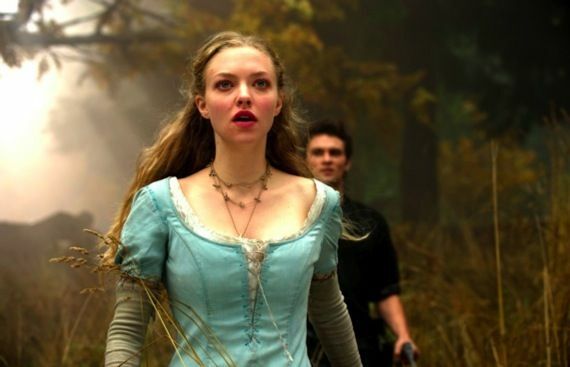 Catherine Hardwicke's re-envisioning of the classic "Little Red Riding Hood" fairy tale has all the teen soap opera hallmarks that have made The Twilight Saga a worldwide phenomenon. A flimsy mystery and a few horror movie tropes peppered here and there provide little sustenance for the boys, who will inevitably get dragged along with their wives/girlfriends to the theater to see this film. In this re-worked version of the classic tale, a small village in the woods has been terrorized for as long as any of the villagers can remember by a ferocious werewolf. The villagers have formed a pact with creature: the beast spares them in exchange for the offering of their best livestock during every full moon. 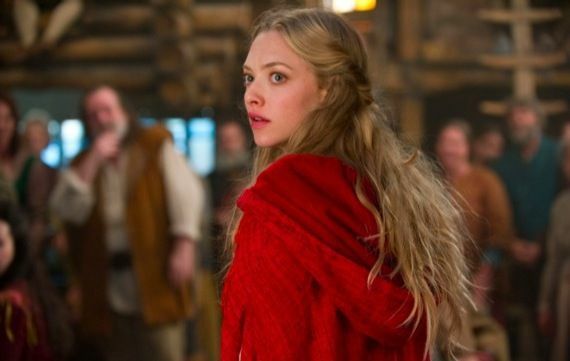 That pact is broken the day the wolf slays a young girl named Lucie, the sister of Valerie (Amanda Seyfried), who is the loveliest girl in the village. Valerie, as we learn early on, has always been secretly wild and edgy - qualities fostered in her by her best friend/soulmate Peter (Shiloh Fernandez), who Valerie has loved since they were kids. Just one problem: Valerie's family has arranged for her to marry Henry (Max Irons), the Medieval village equivalent of the captain of the football team. Henry is a good man, just not the man Valerie wants, a dilemma once faced by her mother (Virginia Madsen). The threads of Valerie's love life and the town's wolf woes intertwine when the infamous Father Solomon (Gary Oldman) comes to town to slay the beast. Unlike the gullible villagers, Solomon knows all too well that werewolves hide in plain sight, in human form, amongst their neighbors, family and friends. Instead of scouring the woods to uncover the beast, Solomon begins to take a hard (read: ruthless) look into the lives of the villagers themselves, quickly exposing secrets long buried and casting the shadow of suspicion on everyone that Valerie knows and loves. With Red Riding Hood, Catherine Hardwicke has created a world that feels more like an well-funded stage play rather than a motion picture. A lot of that stage play aesthetic stems from the huge set piece that serves as the village; with its artificial and hollow feel, and rotating series of shooting locations, the village truly does function as one big stage upon which different acts and scenes of a play unfold. That's not to say this is a terrible thing: the theatrical aesthetic actually goes hand-in-hand with the soap opera story that unfolds, which I would peg as an effective combination, considering the target demographic of this movie. As a director Hardwicke certainly knows what kind of world she's attempting to create, and executes her vision effectively enough. However, for casual movie goers and/or film snobs alike, having an electronica soundtrack playing over what is ostensibly a mashup of soap opera and horror movie tropes makes for a "unique" vision, to say the least. The CGI effects used for the werewolf are a joke by today's standards - but then, lackluster skill with directing action and/or F/X-heavy sequences is one reason why The Twilight Saga tapped new directors for its sequels. Hardwicke's talent for production design really is her - and the film's - greatest strength. The script was written by David Johnson, whose only other screenplay credit is the 2009 film Orphan, a solid thriller with a somewhat original twist to it. Red Riding Hood isn't meant to be a deep or mind-boggling tale, and Johnson mixes the elements of the story - schmaltzy romance, drama, mystery - well enough to keep both sides of the gender line relatively occupied. Some people may guess the mystery early on, but the film does a good job of keeping you somewhat off balance as far as who the wolf might be. While the romance stuff is fairly syrupy, the central characters in the love triangle are all developed enough to have light shades of depth, which was nice to see. Amanda Seyfried is quickly emerging as one of the more talented young actresses in Hollywood - one who shines through no matter what role she's playing or the overall quality of the film. Sure, Red Riding Hood is basically a remixed version of the Twilight premise, but Seyfriend's Valerie is leagues above Kristen Stewart's Bella Swan, who has always seemed like a somewhat outdated representation of a modern young woman - one whose entire existence seems to revolve around boys' affections toward her. Like Bella, Valerie has two suitors she must choose between - but she's a girl who knows who she is, what she wants, and she's nobody's damsel in distress. Seyfried plays the character as a smart, strong and independent-minded young lady; if I had a young daughter, I would definitely want her to be more Valerie than Bella. The cast of supporting characters is pretty well balanced. Gary Oldman is a standout performer no matter what he's in, and Father Solomon is about the most interesting in this film, hands down. Shiloh Fernandez and Max Irons are sure to be sufficient eye-candy for the girls as Valerie's rival suitors (your standard bad boy and good boy caricatures, respectively), and relatively speaking, they're both better actors than, say, Taylor Lautner (not that that means much...). Veteran actresses Julie Christie and Virginia Madsen add some subtle femme-power energy to the proceedings, while character actors like Michael Hogan (Battlestar Galactica) and Twilight alumni Billy Burke sufficiently nail down what little they're given to work with. In the end (as stated clearly at the start of this review), Red Riding Hood is a work that sits on the line between being a competent, above-average soap opera, and a cheesy, below-average feature fiilm. Those who go into the movie with a firm love of those daytime TV novellas will probably be satisfied; if you're not in that camp, then you better think twice before you pay the cost of admission. SIDE NOTE: The film has a few steamy scenes of some heavy kissing, but really it's more sensual than sexual. Parents of teenage girls need not be concerned.